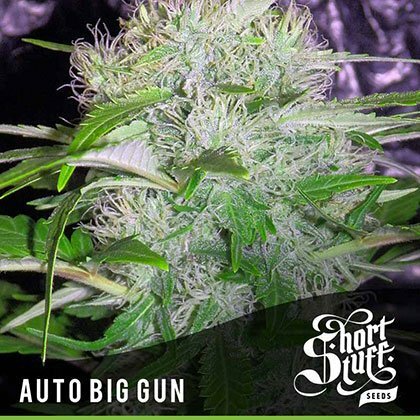 Buy ShortStuff Seeds Auto Big Gun feminised from dope-seeds.com and you will be in receipt of some amazing new auto-flowering genetics from Shortstuff seeds Boutique Line. Big gun starts fast and then accelerates with rapid growth right from the get-go. She does not get too big, maxing out at around 50-75cm (20-30 inches) but she makes solid first and secondary colas which can get as thick as a coke can. Big gun gives off the piney, earthy scents which are typical of AK strains but the odour is not overpowering making it a good stealthy option. The flavour is hash-like with a slightly skunky flavour that is very smooth if the buds have been correctly cured. Where Auto Big Gun really comes into her own is with her potency – she really blows you away! The strength of Auto big gun is quite shocking for an autoflower strain – it is bordering on the Narcotic! Auto Big Gun is a very easy strain to grow and requires little attention to get great results. A good size pot of 5L (1 gallon) with high quality potting compost and plenty of light will bring yields of 30g-60g (1-2 oz) per plant quite easily. Auto Big Gun is part of our Boutique Line of cutting edge Autoflowering cannabis genetics. The Boutique Line contains the most up to date autoflowering genetics which are pushing the boundaries of what can be done with autos. All the strains in the Boutique Line are big, tall, heavy-yielders and have been produced in-house by the Shortstuff master breeders.